If you are a fan of green tea like me, today's LA Times Food Section has more than a few good reads about green tea, such as the one by Cecilia Hae-Jin Lee. There is also an article about chocolate and matcha (powdered green tea) truffles. Can yin-yang, East-West fusion food get any more perfect? Traditionalists say that green tea tastes best when steeped for less than two minutes in water that hasn't quite reached the boiling point (about 180 degrees). 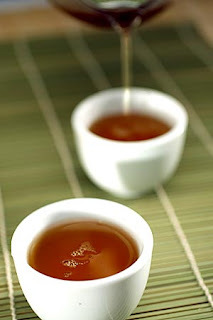 Others say that using water at boiling temperature (212 degrees) and steeping the tea for at least four to five minutes increases concentration of the antioxidant (polyphenol) in the tea. Maybe it's more healthful to brew the tea longer, but I prefer the more delicate taste of a briefer steeping time. However you decide to make it, loose-leaf teas are, of course, preferred. A teaspoon of leaves is enough for an eight-ounce cup.